The pastureland of the Emilia-Romagna region in Italy was once the breadbasket of the Roman Empire. Even now, the rich, fertile land along the Po River is an agrarian wonderland, a quiet jewel that leads all travelers to a set of culinary marvels that have maintained their legend and appeal through centuries. Although the pastoral reaches of the Emilia-Romagna embrace a handful of some of the most culturally celebrated cities in Europe — Bologna is home to one of the oldest universities in the world, Modena is a hub for Italian sports car production, and Ferrara is a designated UNESCO World Heritage Site — it’s the lush, verdant washes of the Po River Valley that offer a true Italian sensory experience void of the more frequent tourist draws. When traveled by bike, it is a place of simple, age-old beauty, discovered on the curves of tranquil country roads and narrow canals. Two weeks later, I was on the side of a gritty road in Chioggia, a town a few hours outside of Venice, strapping on my helmet and pulling on a pair of cycling gloves. 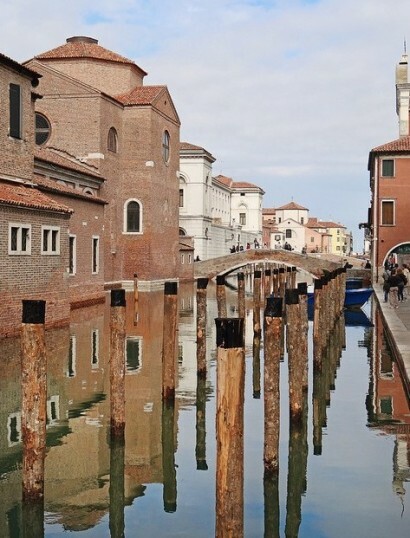 Our first day was a ride along the quiet canals of the Po River Delta, and I relished the thought of a day of pedaling, my mind free to take in the dazzling rows of sun-washed crops and the ruins of medieval farmhouses. 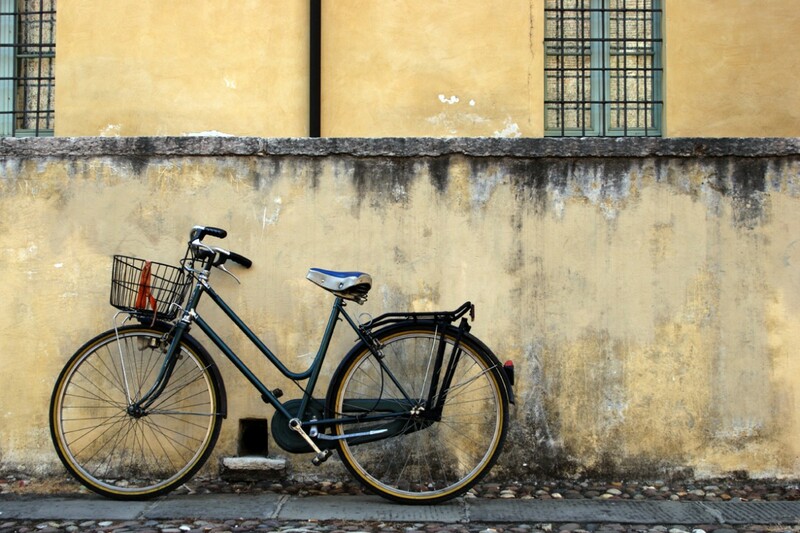 As we pedaled, caught up in the mechanical sweep of rubber against old road, my focus drifted to thoughts of Parmigiano-Reggiano and glasses of Lambrusco, the sparkling red wine produced all over this part of the country. Travelers wandering this part of Italy undoubtedly find their trip centered around food, and the fine art of eating it. From the renowned, dry-cured legs of prosciutto from Parma and the aged, salt-brined wheels of Parmigiano-Reggiano to the coveted, aromatic truffles, scarlet-skinned Vignola cherries, and family-recipe balsamic vinegar so thick from age that it’s the texture of syrup — each stop is riddled with tastes. I knew that my memories of this trip would be connected and illuminated by the things I ate along the way. That first day, our muscles ached as we made the final labors to our place of respite for the night, a small agriturismo called Ca’ Laura, a farm that produces its own salamis, cheeses and vegetables. Sitting at the rustic kitchen table that night, we feasted on plates of salumi, stewed vegetables, and crusty bread. The owners, our only companions for the night, poured crimson Lambrusco made just a mile down the road. The next morning, our bodies rested for another day of riding, we made our way to Ferrara, a city dominated by bicycles. The city center buzzed with them as natives made their way to classes at the centuries-old university and vendors peddled smooth scoops of brightly-hued gelato on fragrant cones. Ferrara is the only city in Emilia Romagna with a continuous Jewish presence from the Middle Ages to the present day. The influence of this community can be tasted in the local cuisine, in foods such as tagliatelle con ragù (meat sauce over pillows of fresh ravioli filled with butternut squash), Parmigiano-Reggiano laced with nutmeg, and a half-moon shaped spiced meat variety served in a white sauce made with cream and local truffles. At a bakery found mistakenly on a hidden cobbled thoroughfare, we picked out delicacies made with flaky layers of pastry and stuffed with apricot jam and dark chocolate. Over the next few days, we continued our journey along the Po River to Mantova, a lake-bound city known for opera and the regional specialty, risotto, by way of country trails that ran by ancient abbeys and riverside hamlets. We stopped in small towns for bowls of handmade pasta and delicately-crusted neapolitan pizzas, joining the neighborhood lunch crowds. In May 2012, two major earthquakes rocked Northern Italy, causing widespread damage. 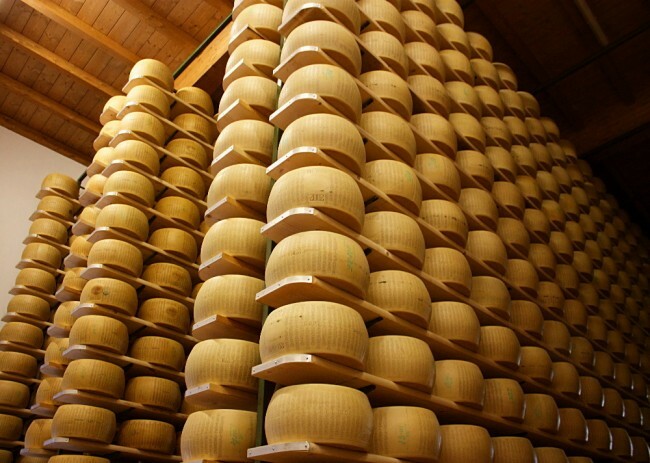 The Parmigiano-Reggiano producers lost many of their aging wheels. Now they sell passerby like us craggy chunks of the damaged cheeses. As we explored the River Secchia, we visited a sprawling dairy, walking amongst the towering cheese spheres as they lay in wait of completion. In Modena, we biked a few miles outside of the city to a warehouse that emanated the salty tang of prosciutto left to cure. We ate paper-thin slices of it, which seemed to melt like butter when draped over pieces of freshly toasted bread. In a dim attic, we witnessed the mysterious art of balsamic vinegar tradition, a process that remains secretive within families from generation to generation. The vinegar, aged for up to twenty-four years in wood casks that range from chestnut to juniper, gain complexity from the extremes of cold in winter and heat in summer in the aging attics. The vinegar was sweet and viscous and regarded by our guides as a precious ingredient not to be wasted. When you travel by bike, even when traveling with other people, it’s a time for reflection, and sometimes much needed vacancy. You can explore the roads and trails at your own pace, admire the scenery without interruption, and keep your thoughts to yourself. Sometimes my mind rested on nothing but the color of the flowing Po, or the passed ruins of some ancient farmers’ dwelling. And now and again, alliances were formed. I’d share a rare conversation with my uncle, talk music with my cousins, or touch on thoughts of future plans with my aunt. Often, these groupings would disperse like birds in flight, with each of us returning to our own place on the road, focusing on the own whirring mechanisms of our bikes. At a bucolic street cafe or in an other-wordly, medieval city square surrounded by the stone monoliths of era’s past, we would eat together. The seemingly endless stretch of miles we conquered daily, and the ache of tired muscles, offered us the just reward of truffles shaved over fresh, hand-rolled pasta, plates piled high with layers of silky prosciutto, tangy balsamic drizzled over tomatoes and the pure white slabs of mozzarella, warm cherries out of brown paper bags bought on the side of a hushed country road, and — at the end of it all — a sense of community with both family and land. It seemed to me that perhaps the best way to discover the complexity of a place is on your own set of wheels. Samantha Alviani is a writer based in Denver, with a focus on food, music, and travel storytelling.